Have you ever visited a nursery in search of a tree and been overwhelmed by the wealth of choices? Selecting a tree is a big decision, and those of us who live in Seattle, Bellevue, and elsewhere throughout the Puget Sound region have an amazing array of trees to choose from. The fact that trees can be expensive and are usually long lived makes their selection even more daunting. Landscape designers have the training and experience to help you select the perfect tree to grace your landscape. This is the first of a two-part article that discusses the role and selection of trees for our Northwest landscapes. Why Do You Need a Tree? Trees provide countless benefits, not just for humans but also for the larger world—truly, we couldn’t live without them. Not only do trees add an aesthetically pleasing element to a landscape, thereby also increasing your property value, they also make us feel more peaceful—surgical patients have been shown to recover more quickly if they can see trees from their hospital rooms. And the scale of trees allows them to be enjoyed by you and your neighbors alike. Trees serve practical functions such as providing shade on hot summer days, blocking winds, and screening unsightly views. They take up water in their roots, reducing the likelihood of flooding during heavy rains. Their network of roots can also help bind the soil, reducing the risk of landslides, and the decaying foliage from deciduous trees enriches the soil. In cities, trees moderate the heat island effect created by pavement and buildings, and they help improve air quality by absorbing air pollution into their leaves and giving off oxygen. Without trees, you probably won’t have many birds visiting your yard. Birds use trees for nesting, resting, feeding, and shelter. Many homeowners become anxious on the subject of trees—will the tree get too big, will it block a view, will it be messy, and will the roots block the sewer line? All of these concerns have some validity, but selecting the right tree for the location and caring for it properly will minimize the likelihood of an undesirable outcome. The complaint about trees being messy, however, is somewhat difficult to address. All living trees grow and shed throughout the seasons. Deciduous trees lose their leaves; evergreens shed their older leaves or needles; pollen drifts and can blanket an area; and flower parts, cones, and fruit will all drop to the ground in due time. Their litter can be reduced by, for example, planting a tree that bears a pulpy fruit or is prone to aphids away from a walkway, activity area, lawn, or parked cars, but tree litter cannot be eliminated entirely. Appreciating this cycle might require a change in attitude away from the need for a pristine property and toward a reverence for what a tree contributes to your landscape and to the larger world. What’s the Best Tree for You? The best tree for you depends on different criteria. Site conditions, such as soil type, sun and wind exposure, and soil hydrology, can all affect the decision as to what tree is best suited for your landscape. In addition, personal taste as to foliage color, blooms, and other aesthetic considerations will further narrow down your search for the perfect tree. If your objective is to beautify your landscape, you might consider a tree that is beautiful in every season, such as Japanese Stewartia (Stewartia pseudocamellia). In autumn, the leaves of this deciduous specimen become rich orange and brilliant red. After the leaves fall, you can fully appreciate the mottled bark along its trunk and branches—a patchwork of pink, red-brown and gray—along with its striking branching pattern. 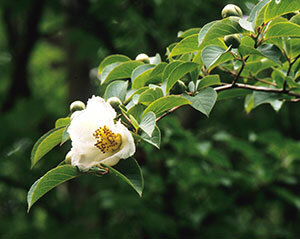 Come summer, when the burst of spring flowering is over, white camellia-like flowers adorn the branches of Japanese Stewartia. Other deciduous trees with year-round interest include Tall Stewartia (Stewartia monadelpha), Cornelian Cherry (Cornus mas), and varieties of Crape Myrtle (Lagerstroemia x indica) with names such as Muscogee, Acoma, and Natchez. Conifers also can be interesting year round, with their lovely needles, colorful cones, and unique forms. Blue Japanese White Pine (Pinus parviflora ‘Glauca’) has soft, gray-blue needles with white stripes and two types of cone--mauve-pink pollen cones and leathery looking seed cones. Among the many other conifers that are striking year-round are our native Mountain Hemlock, Contorted Japanese Larch, and Weeping Giant Sequoia. 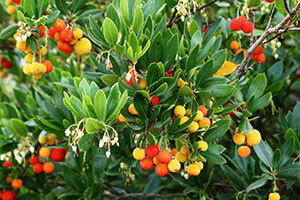 And don’t overlook broadleaf evergreens, such as the Strawberry Tree (Arbutus unedo). This small tree has all of the attributes or our native Madrone (Arbutus menziesii) but none of its drawbacks. 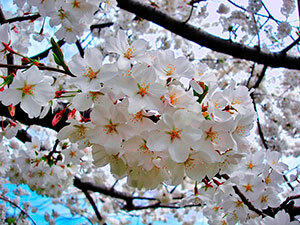 Its common name comes from the red, strawberry-sized berries that adorn the tree in the fall—at the same time its white, bell-shaped flowers appear. Arborizing a Strawberry Tree by removing its lower side branches enables you to better appreciate the exfoliating, reddish bark, which contrasts handsomely with its leathery, dark green leaves. Many specimen trees can stand on their own as focal points in a garden, filling much the same role as a showcased sculpture. 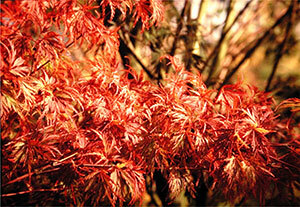 The endless varieties of Japanese Maple differ in size and the color and shape of their leaves, but their unique forms, flowers, samaras (the helicopter-like structures that hold the seeds), and fall display can stop viewers in their tracks. Acer palmatum ‘Seiryu’ has finely dissected bright green leaves that become orange-gold in autumn. It differs from most cut-leaf varieties in that it has an upright vase-like form at maturity. The gorgeous foliage of the Golden Full Moon Maple (Acer shirasawanum ‘Aureum’) is bright lemon yellow in spring, turning chartreuse in early summer. Nestled in the foliage are deep pink samaras. In autumn, the leaves exhibit tones of orange and red. The Windmill Palm (Trachycarpus fortunei) is a perfectly hardy evergreen tree, but it catches our attention—and imagination—because it appears out of place in the Northwest, evoking where we might dream of being during the bleakest Northwest months, rather than where we are. Even the mild Puget Sound region has some sweltering summer days, when nothing—save a dip in the lake—can provide relief like the broad canopy of a shade tree. 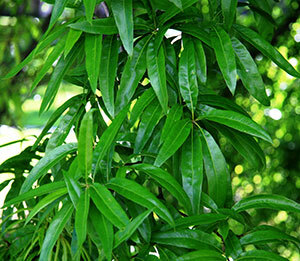 What comes to mind when thinking about a shade tree—a willow, an oak? How about a Willow Oak (Quercus phellos)? This adaptable oak has narrow, willow-like leaves and with maturity takes on the form of a classic shade tree. Another good shade tree candidate is the fast-growing Green Mountain Sugar Maple (Acer saccharum ‘Green Mountain’), with its strong straight trunk, lovely uniform crown, and classic maple-like leaves that become rich orange and scarlet red in fall. And on sunny days in April, there’s nothing quite as wonderful as lying below the low, broad canopy of a Yoshino Cherry (Prunus x yedoensis), looking up through its cloud of white flowers. Among the more disease resistant of the flowering cherries, which as a group are not fond of our cool wet Northwest springs, the leaves of the Yoshino Cherry turn golden yellow with orange highlights in fall. Clearly, there’s much to consider when selecting trees—indeed, the topic has proven too large for one article! 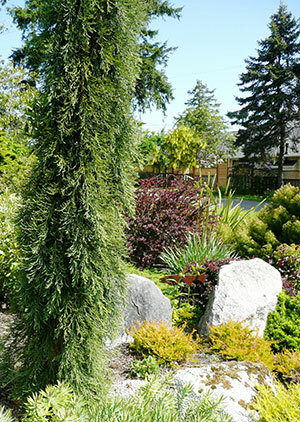 Part 2 of this article, “More Practical Tips from Landscape Designers,” will appear on the APLDWA website in June 2014 and will offer suggestions for trees to enhance views, trees to screen undesirable views, and trees for problem or challenging sites. Then, once you’ve considered the choices and have decided upon a particular tree, advice will be offered on how to select the best specimen from the stock available at your neighborhood nursery. In the meantime, should you find yourself in a quandary concerning trees, Seattle-area landscape designers and landscape professionals have the knowhow—and the passion—to assist you!